Members of Parliament (MPs) across the political spectrum have written to the Prime Minister's Office (PMO) and the Central Vigilance Commission (CVC), seeking a probe into a stake sale deal between Jet Airways (India) Ltd and Gulf-based carrier Etihad Airways. Prabodh Panda of the Communist Party of India (CPI)'s along with the Bharatiya Janata Party (BJP)'s Nishikant Dubey, had written to the CVC, demanding the deal be investigated. "I had stated (in the letter) how the deal has been struck just to benefit the private players, which will hamper the interest of the state-run Air India," Panda told Business Standard. "This has been done in violation of all norms and deliberately done to cause losses to the state-owned carrier. We have asked for a vigilance probe into the matter." He also alleged profitable routes had been given away to private players at low rates. 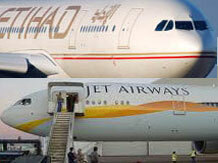 Delhi airport, which is attempting to emerge as an international hub, would also suffer at the cost of Abu Dhabi. Etihad in April agreed to buy a 24 per cent stake in Jet for $379 million on the same day the Indian government increased traffic rights nearly four-fold to 50,000 weekly seats to Abu Dhabi. Critics of the deal say the aviation soaps offered to Abu Dhabi would indirectly help Jet. Apart from complaints to the CVC, CPI's Gurudas Dasgupta, Communist Party of India (Marxist)'s Sitaram Yechury, BJP's Jaswant Singh and Ajay Sancheti and Janata Party's Subramanian Swamy had written to the PMO raising concerns about the deal. Trinamool Congress MP Dinesh Trivedi had sent a letter on April 20 to the prime minister, demanding the deal be stalled. "The question that needs to be asked is why the tearing hurry. Especially when Air India does not want it, four Union ministries have raised objections to the deal. The standing committee has already raised objections to it," Trivedi told Business Standard. The PMO, in a detailed response on its website today, tried to brush aside the concerns. It said MPs'complaints were all addressed. "Letters relating to security concerns in the context of the FDI (foreign direct investment) in civil aviation were referred to the cabinet secretary," while those "relating to the the Jet-Etihad deal were referred to the ministry of civil aviation, department of industrial policy and promotion, department of economic affairs and the ministry of corporate affairs for examination", it said. Regarding the bilateral air services agreement between India and the United Arab Emirates, "the Cabinet note was asked to be kept in abeyance till responses on letters with complaints on the agreement and on security concerns were received". Meanwhile, Civil Aviation Minister Ajit Singh brushed off all these complaints terming them "political", written with an eye on the coming elections. "There are no uneven benefits in the Abu Dhabi bilateral. The issue is that it's a political thing. Basically, elections are coming. They (opposition) have been attacking day in and day out, this minister and that minister. But I wished they checked their facts," said the minister. "In terms of FDI (foreign direct investment), it is bigger than any other deal this year. There are so many dimensions to it." When the bilateral air services agreement with the UAE was inked in 2007-08, both sides agreed to enhance air traffic rights for flying 29,000 seats from 18,000. Later, an additional 29,000 seats were granted to the UAE, Ajit Singh said. "We gave them additional cities (in India) when Indian carriers were using much less. Swamy was around then. Jaswant Singh was around then, Yechury, too, was around ...(Jaswant) Singh has a problem. But we are following the same rules that existed when he was the defence minister," he added. Could Rahul lose Amethi if SP went back on its word?